Size is usually the first thing that comes to mind when we ponder the great airships. In war and peace, to most people they seem bigger than life itself, bright, wondrous, sometimes dangerous apparitions that engender a religious awe. They remain the largest crafts that have ever been launched into the sky. Tracing the history of the airship from its beginning in the nineteenth century to its fiery conclusion in 1937, Robert Hedin has gathered the finest stories, descriptions, poems, music, and illustrations about what the era was like in fact and in spirit. Included are vivid accounts by such legendary figures as Count Ferdinand von Zeppelin, Hugo Eckener, and Alberto Santos-Dumont as well as memoirs, logs, journals, and diaries by Zeppelin commanders, crew, explorers, journalists, and survivors of ill-fated flights. The great airships inspired poets and writers old and new; here are works by such diverse writers as Robinson Jeffers, Kay Boyle, Bernard Shaw, D. H. Lawrence, Rita Dove, Richard Brautigan, and many others. There is a rich sampling of airship musical scores and lyrics; the music constitutes a kind of recovered history and helps recapture the emotional range of the era. 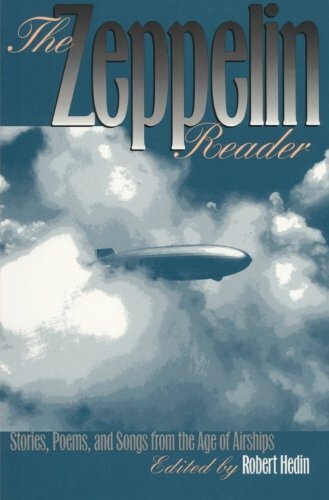 Rounding out the gathering, The Zeppelin Reader is illustrated with stunning photographs, advertisements, drawings, and cartoons from the glorious age of airships.